A former journalist and film-maker at the BBC, Bridget worked as a producer and director for both television and radio. 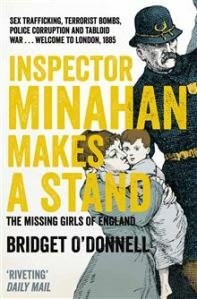 Her first book, Inspector Minahan Makes a Stand, was recently published by Picador. It tells the story of a Victorian policeman who exposed the trafficking of British girls in the 1880s and the powerful men who paid for the trade. To order the book now click here. To read some reviews click here. Inspector Minahan was stationed in Chelsea in the early 1880s when he met Madam Jeffries, London’s most notorious brothel madam and trafficker. Their meeting in August 1882 changed the course of British history. To read about it click here. When the book first launched she spoke to Robert Elms on BBC Radio London. To listen again click here. (30 minutes in).